Shadow, Barry Toubin's 1975 T-26. Sail Area: 270 sq. ft.
1. Use Bainbridge Dacron or equal with a fill to bias ratio not to exceed 1 to 4. 2. Bolt rope size on main luff and foot to be 3/8 dia. Interestingly this doesn't quite match the diagram which gives the measurements as I=29.33, J=9.42, P=25.17, E=10.42. Sail areas are Main=132, 100% jib=138. "What happened to the Columbia molds" is not an uncommon question. According to a former Columbia owner, the T26 molds were purchased by another company. Here is an exchange that took place on the mailing list. I have found a T-26 that the owner says was built by Commodore in 1982. I am going to look it over Saturday. Some details the owner gives are: outboard eng., 6 opening ports, wheel steering, draft 2.1, disp. 4225, ballast 1500, Payne design. I mention these as they seem to differ somewhat from info I have been able to dig up on the Whittaker models. 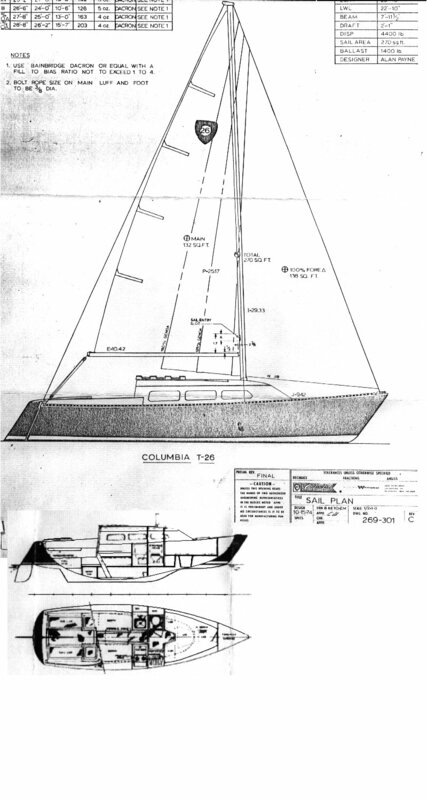 The photo you see on the website of the s/v SHADOW is my old boat. My neighbor, and sailing buddy Rick, has the same boat, marketed as a Commodore, likely the one you ask about. I suspect that Commodore bought the mold for the T-26 after Columbia went out of business. Rick's boat differs in a few ways. It is a fractional rig. All of the ports are opening, unlike the Columbia model. There is a GENEROUS amount of teak in the cabin, sort of an upgraded model. The interior was changed a bit, I prefer the Commodore edition over the Columbia. The foreward hatch is on the flat deck of the Columbia, and mounted in the foreward trunk of the Commodore. It is a great boat, Rick paid 4500 for his, in bristol condition. If you want to know anything else, let me know. We have two of them here in the Barnegat Bay in Nj. It is a rare boat. Commodore's logo on the sails is 3 black stars on the mainsail. A 1983 Horizon 26 appeared on eBay. It is claimed to be made from the Columbia T-26 mold and it certainly looks it. Pictures and more info here.